The Federal Aviation Administration granted 76 waivers to its new Part 107 regulation on August 29, the effective date of its rule governing the commercial use of small unmanned aircraft systems (UAS) weighing less than 55 pounds. Those waivers—allowing exceptions to the regulation’s operating conditions—mostly involve flying at night, said FAA Administrator Michael Huerta. 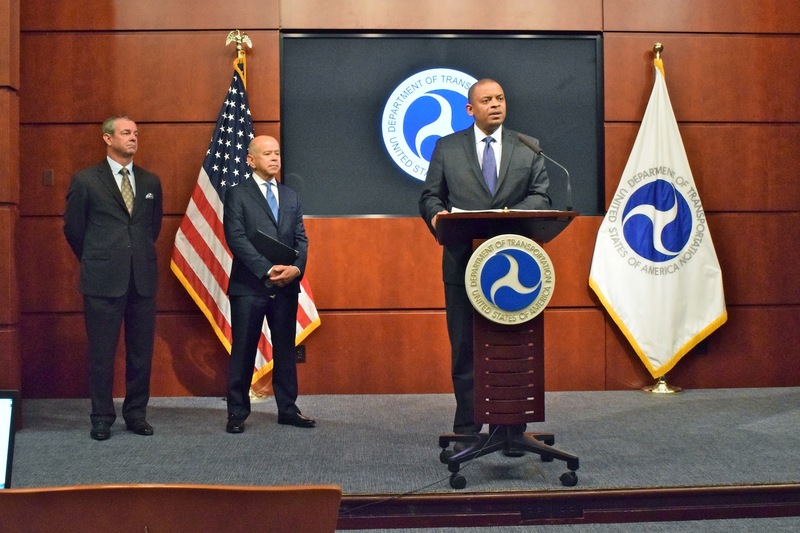 During a briefing at the U.S. Department of Transportation headquarters in Washington, D.C., Huerta and Transportation Secretary Anthony Foxx marked the first official day of the Part 107 rule, which the FAA released in final form on June 21 after a decade or more in development. Brian Wynne, president and CEO of the Association of Unmanned Vehicle Systems International (AUVSI), accompanied them on stage. Part 107 requires that individuals who plan to operate a small UAS, or drone, for money obtain a remote airman certificate and fly the aircraft no higher than 400 feet above the ground, no closer than 400 feet from a structure, within visual line-of-sight and only during daylight hours. Operations within any class of airspace other than in Class G uncontrolled airspace require permission from ATC. Until the regulation became effective, individuals and companies seeking to fly drones for commercial purposes had to apply for an exemption under the Section 333 provision of the FAA Modernization and Reform Act of 2012. The agency estimates there could be as many as 600,000 drones used commercially in the first year of the rule, Huerta said. The regulation does not allow beyond visual line-of-sight (BVLOS) operations, flights over people who are not involved in the operation and flights at night. The FAA plans to release a draft rulemaking by the end of the year on flying over people, and, separately it will develop rules for BVLOS operations, Huerta said. For now, however, Part 107 allows for exceptions to the operating conditions through a waiver process, something commenters sought after a draft of the rule was released to the public. As of the first day of the rule, more than 3,000 people had signed up to take the 60-question aeronautical knowledge test, called the Unmanned Aircraft General (UAG) examination. The FAA also granted 76 waivers to the regulation’s operating conditions, of which 72 were for operations at night. Some of the waiver requests were initiated under the Section 333 process, Huerta said. Among the recipients were cable news network CNN, BNSF Railway and aerial data company PrecisionHawk, which are participating in the FAA’s “Pathfinder” program for drone research into BVLOS operations and flights over people. Separately, CNN announced on August 29 that it has received a waiver to fly the Fotokite Pro, a tethered, camera-equipped quadcopter that weighs less than two pounds, for operations over people. Reacting to the first day of the Part 107 rule, the Air Line Pilots Association (Alpa) said the regulation is “missing a key component” that would ensure all people who operate drones commercially have a standard level of aeronautical knowledge and training. “Throughout the rulemaking process, Alpa urged the FAA to take a stronger stance to ensure that those who remotely pilot sUAS for commercial purposes are fully trained and are able to demonstrate knowledge via a written test and skills via a flight test before they are issued a commercial pilot certificate for sUAS, just as pilots of manned aircraft operated for commercial purposes do,” the association stated. Alpa also called upon Congress to give the FAA more authority to regulate the recreational use of drones.